I am always a fan of wool clothing because simple you can create creative knitted blouses and dresses that can be quite elegant and comfy. So, if you too are into wool for knitting, then, you can find good material for knitting or simply try wool shop for some instant wool stuffs like knit patterns, yarns, needles and more. Wikipedia describes wool as "any textile fiber from sheep or certain other animals . . . like goats, rabbit or camel." And, with these natural fiber, you bet, you would only feel their comfort and warmth. Now, that Christmas holidays are coming and the cool breeze that goes with the holidays can make the wool knits more practical. Just like the musical movie, "The Producers," where Uma Thurman sang a line saying, "if you have it, flaunt it." I say the pictures above affirm this statement quite true. 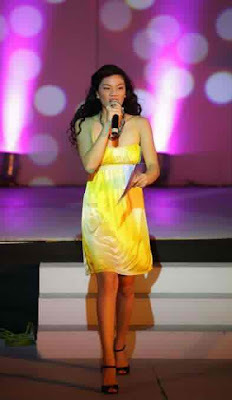 Not only that the dresses flatter more the ladies' figures but they can be used to deceive people of curves. So, who says these dresses are for celebrities too? My pop and I had a very recent vehicular incident as we took the national highway heading to work and as we approached the intersection, we were suddenly caught off - guard as another vehicle tried to cut our road. So, to avoid collision, my father just hit the break making us fall from the motor bike. I had to endure some sore legs while my pop was ok and scratches for the bike. There are simply so many vehicular incidents that we hear everyday ranging from minor injuries to severe and fatal ones. It is then very crucial that passengers and drivers wear protective gears and / or have their seat belts strapped for lesser damages. Somehow, the emergency team like air ambulance service and other responsible watchers can help the victims save their lives and from more serious physical injuries. That last vehicular mishap was quite traumatic that I had to prefer public commute than riding with my father again. I could only hope that the local government shall be responsive about my complaints against that irresponsible driver who almost hit us. Just next to our local boutique, we had to acquire boxes from a MYBOX stall of Gaisano Mall where all owners can make use of the small boxes to sell practically anything. And, since our boutique has limited space and view with all our stuffs to sell, the boxes for a few months shall be practical to dispose stored authentic and brand new perfumes for men and women as gifts or personal properties. And, with different owners and freedom from personally selling the stuffs, the business strategy is quite smart and practical at very meager rental space rates. Owners can acquire collection agencies to address payment issues. We can practically update the contents of our boxes and the exposure to bypassers and potential buyers can make the sale quite feasible. 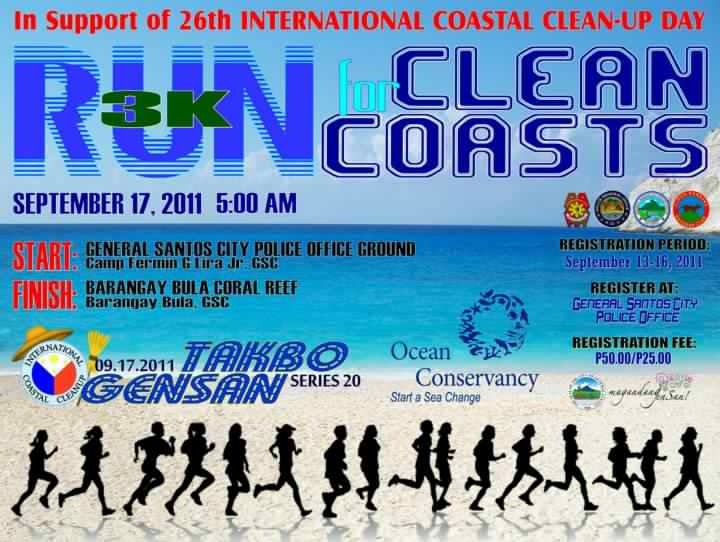 Tomorrow shall be another big run day for me as I join another good cause and this time it is for Mother Earth. 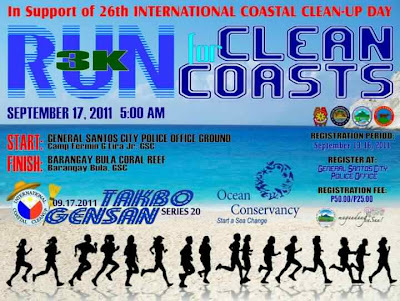 I shall be joining this Clean - Coast run along with other runners and at the finish line, we shall be cleaning up our beloved local beach. But, I have to scout for a good pair of running gears again because the sea sand might make my new running shoes stained and dirty. I wish I can run with my kid but the long race shall be too much for his tiny legs and heavy weights. Perhaps, if his dad is around, he can join the 1.7 km race instead. I hope to have a good run tomorrow with my comfy running attire. Wish me luck! 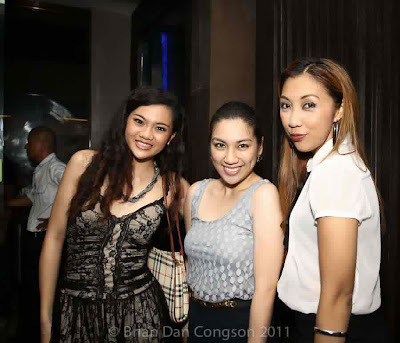 Last September 12, 2011, billions of Miss Universe 2011 were glued to the big screen if not to the live center stage and we could only anticipate for our various representatives. Of course, as a Filipino, we could only be proud of our representative, Ms. Shamcey Supsup, who eventually bagged the 3rd Runner - up. But, we could give praises and awe as we saw the 88 beautiful finalists in their glamorous glitters of gold, silver and diamond from their dresses and jewelry among others. They quite exude elegance and pride and while only the top 5 culminated the big day, I personally believe, all the ladies are big winners for being the finalists. While September 13 was not at all an all - stop event for Filipinos unlike when international boxer, Manny Pacquiao, takes the boxing arena. But, we take the pride and honor as our Philippine representative to Miss Universe 2011, Shamcey Supsup, bagged the 3rd runner - up. While we respect and confident with her answer in the Q and A portion, we still respect her title but for every Filipino, Shamcey Supsup is our Miss Universe. 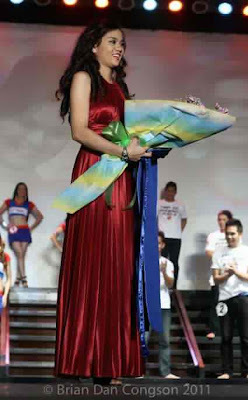 So, cheers to every Filipino and best of all to Ms. Shamcey Supsup for bringing the beacon. I happened to received a video tag from a fellow college teacher about this cool fashion evolution and while I viewed the dancing and transition, geez, I couldn't help but be wondered. So, here it is for you to view too.